Attempted to Run 2017 – but race was canceled due to weather. Vowed never to come back because we were upset the cancellation was poorly announced and people that traveled didn't get any discounts to sign up the following year. 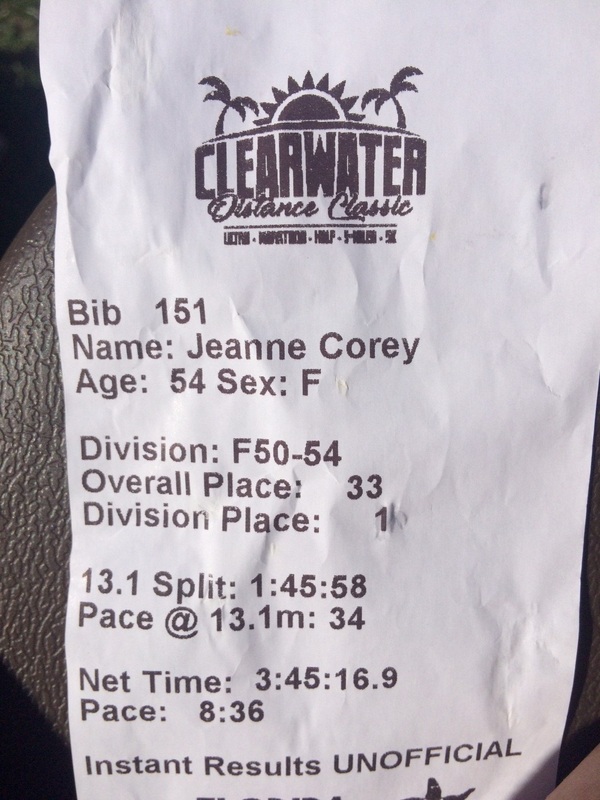 I can understand that the race director had his hands tied with the city of Clearwater telling them they had to cancel the race but finding out when we were at the bib pick-up was tough. There were no email notifications. 2018 - Then it happened, winter in CT. It was a dark snowy night and Kim and I were discussing training for Boston. “Boy it would be nice to get a long training run in somewhere warm” I said, “You know I looked up fights to Miami and round trip it was $107.00”. That was our first mile, then Kim said “Really?, that would be a nice quick weekend getaway to warm up”. Then a few more miles went by, silence followed by “When we get in the house we should really look into flights”. As soon as our run was over we were sitting side by side on our computers looking up flights. We noticed if we flew the week earlier then it would be cheaper. 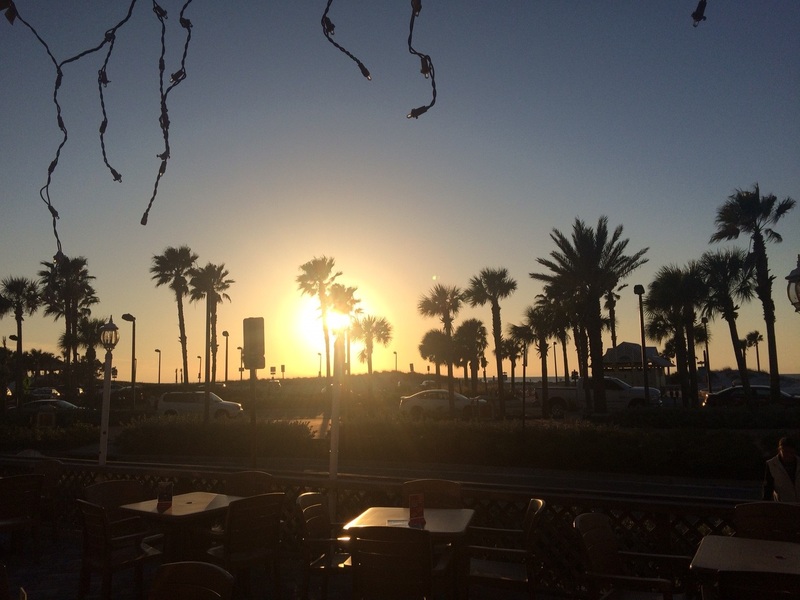 So the madness continued, I started looking up FL marathons the week earlier and there it was….Clearwater Beach Marathon. You know what happened next, we signed up, booked our flights and found a Groupon for a hotel. This is a very inexpensive marathon because the registration fee is really reasonable (65.00) and it’s off season so hotels are inexpensive. Logistics are great! - Easy to get to and parking is next to the start so you don’t need to check a bag. Plenty of Port-o-lets at the start. 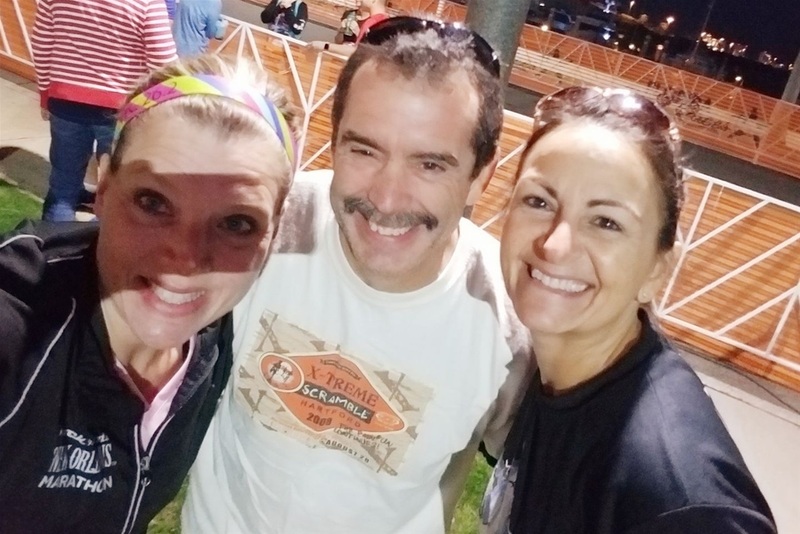 I love running - I always meet new friends at races. This race I met Heather at the bathroom line who was running her first Ultra at the Clearwater Distance Race. Pretty impressive! She was super nice and we found we had a lot in common (other than running) and made friends of Facebook so we could stay connected. She ended up placing 2nd in her age group too! Bib pick up is available on race day. NICE race shirts. Not the typical tech material – but a nice soft blue t-shirt. Very small race so if you’re running alone, you are alone. There was no one in front of us or behind us. With that said – there is little to no crowd support. An occasional cluster of a couple of people but that’s it. The water stops were frequent and they had oranges at the higher miles. The ladies at the water stops were fantastic – some came running to you with the cups of water! These water stop had great crowd support – cow bells, cheering, and very well organized. The first 6 miles were pretty cool. We started at the park on some pretty narrow streets so I had to dodge slower runners to keep up with the pacer. Then we went over a bridge with beautiful views of the ocean. We ran into Clearwater Beach near our hotel and then over the next bridge with breathtaking views. We were headed on our first LONG STRAIGHTAWAY! It seemed NEVER ENDING and FLAT! “Follow the path” they yelled, but there was no path. We started toward what we thought was a path and could hear someone yell “no – you’re going the wrong way”. It was a so confusing. Finally a runner yelled to us where to go. Then we turn on a bike path. Yes, ANOTHER LONG STRAIGHT AWAY! There was little to no scenery for distractions. Basically you on a bike path with houses on both side. The houses all had fences for privacy. There were no port-o-lets on the path. There were water stops at each of the street crossings though. This bike path went on for 9+ miles. I pulled every trick out of my hat to keep my mind occupied to get me though. It was getting hotter and hotter and there was little relief for shade. We finally headed out onto a main road which is not closed but coned off for runners. They announced our names as we ran through and had some Dunkin donuts Tropicana smoothies, water and of course the medal. We got a couple really nice icepacks from a vendor. They are called CI-Yomax - refreezable enclosed in nice soft blue pouch that has a stap to stay in place if you're injured. The medal was pretty cool – it was a pair of flip flops with a bottle opener in one of them. The post marathon party was pretty impressive. They had Sam Adams beer, truly sparkling spiked water, pizza, pasta, bananas and oranges. The food never seemed to run out either. When we were leaving they were taking down some of the vendor’s tents but the food & beer remained. I was pleasantly surprised to find out that I placed 1st in my age division and Kim placed 3rd. There were a lot of runners that didn’t finish though. I got a pint glass and coaster that said I placed in my division. I also got a $25 gift card to a local running store. On the way home I went to use it at the Fit2Run store and found out it was for $15.00 and not $25.00. I emailed the race director to see if there was a mistake with issuing them. I also noticed that the award that they advertised on their website for “grand masters” was not in the results and that I had placed 1st in that division too. I emailed the race director with this question as well – still waiting to hear back. I am not sure if the race photos will be free or not. The previous races had them free. There is nothing on their website with anything about photos. Would I run it again? I don’t think so, although the race served its purpose. 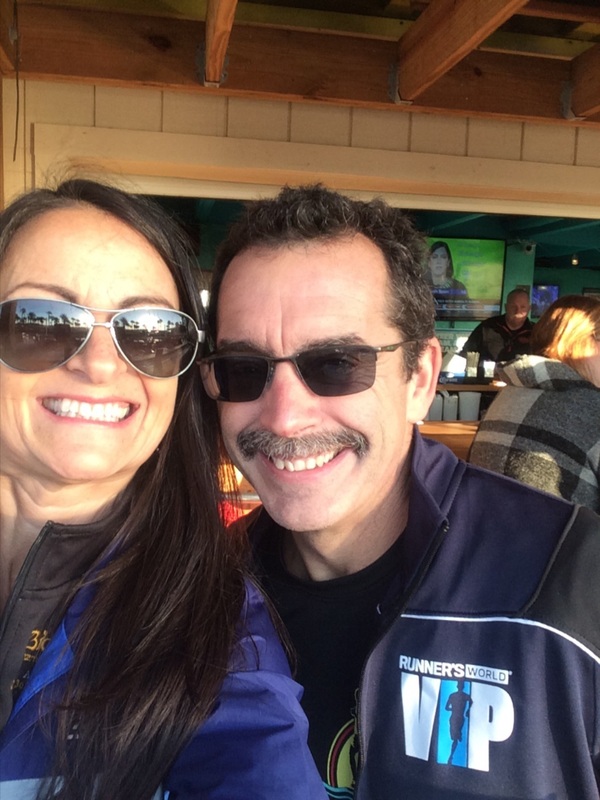 We got our warm training run done and it was pretty cool to have placed on my 50th marathon.